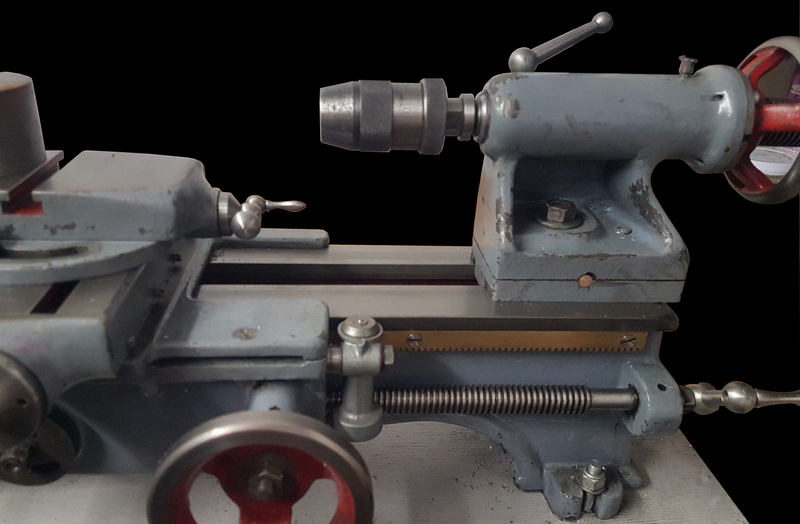 A product of the late 1940 and early 1950s, the Warwick 3.5" x 18" gap bed, backgeared screwcutting lathe was marketed by the Victa Engineering of Maidenhead, Berkshire, England - but was actually just another modified version (along with Granville and Randa) of the better-known Grayson. Victa, as manufacturers (or more likely agents), were also involved in production of early versions of the Centec milling machine and the Hobson lathe and later, having moved to Pool in Dorset, also made the Eagle surface grinder, a model originally manufactured by Dronsfield Brother, makers of Marlow milling machines. For its era the Warwick exuded a rather old-fashioned air, with simple, pre-war style headstock bearings of split bronze carried in largely unbraced housings and a V-edged bed with a graceful curve joining its two mounting feet. 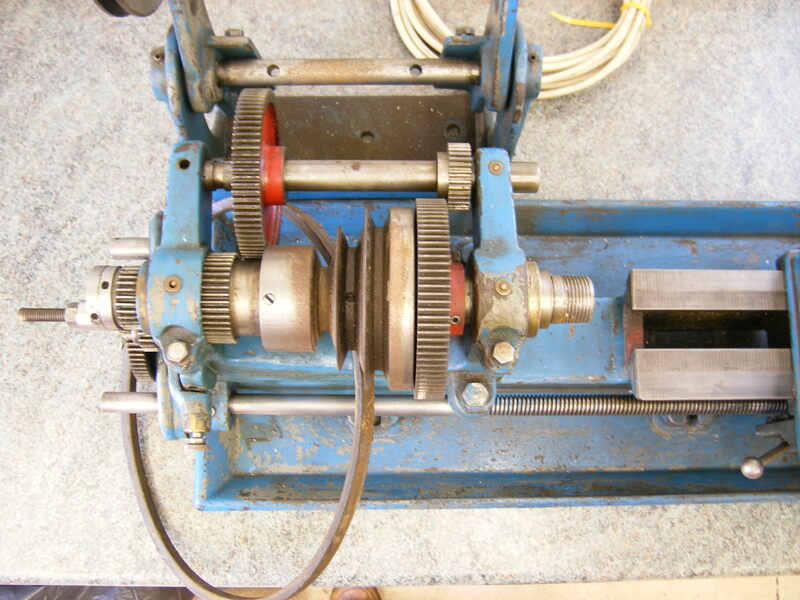 Although the lathe was supplied, as standard, without a countershaft a fully motorised version was also offered, ready to run with the robust 3-speed countershaft provided as either a separate unit for bench mounting (cost £5) or, for a substantial 85% extra on the basic price, bolted to the back of the bed as an integral unit. There is some evidence that Victa may have made or commissioned the countershaft themselves, for the one illustrated in their catalogue, with its distinctive swept-back and pierced uprights, is distinctly different to any the writer has seen driving a Grayson. The customer could choose either a flat or V-belt drive to the three-speed, 0.5" bore spindle (with its 1.125" x 12 t.p.i. thread) but, while the motor belt was guarded, that to the headstock was without any sort of protection. 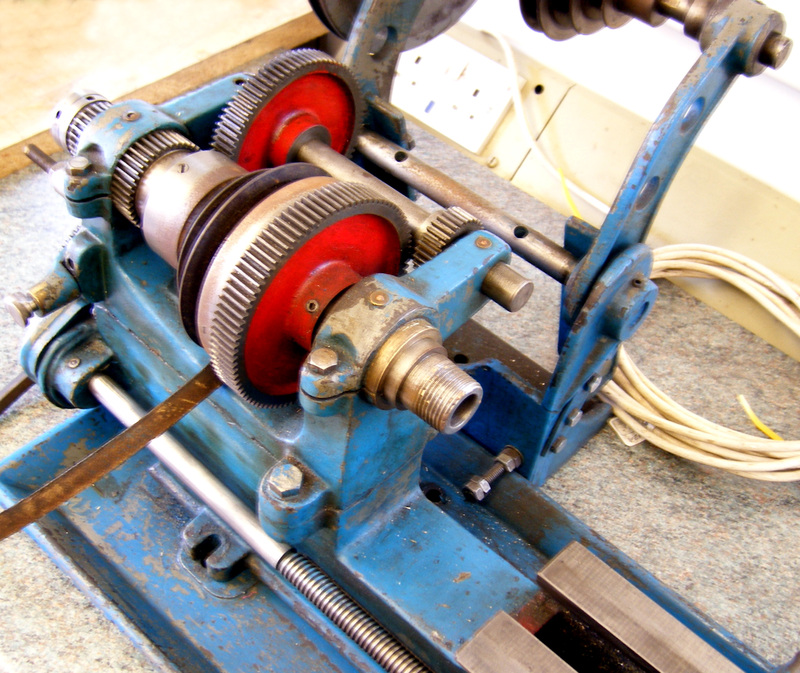 Happily, the spindle thread was the same as used on Myford Series 7 lathes, though the register behind the thread was a little larger. The backgears, continuing the classic theme, were either unguarded on the basic model, or covered with rudimentary cast-iron or cast-aluminium strips on the upmarket version. Both the top and cross slide - unlike the conventional units on the Grayson - were cast in one piece with integral end plates However, like the Grayson, the cross slid carried two transverse T slots (rather on the lines of the early 1940s Myford "4-inch Precision") - with the top slide having two T slots as well. If the top slide micrometer dial was very much too small, that on the cross slide was not only unusually large but also formed with a stylish curve to its face - a design that, in all likelihood, came from Granville. 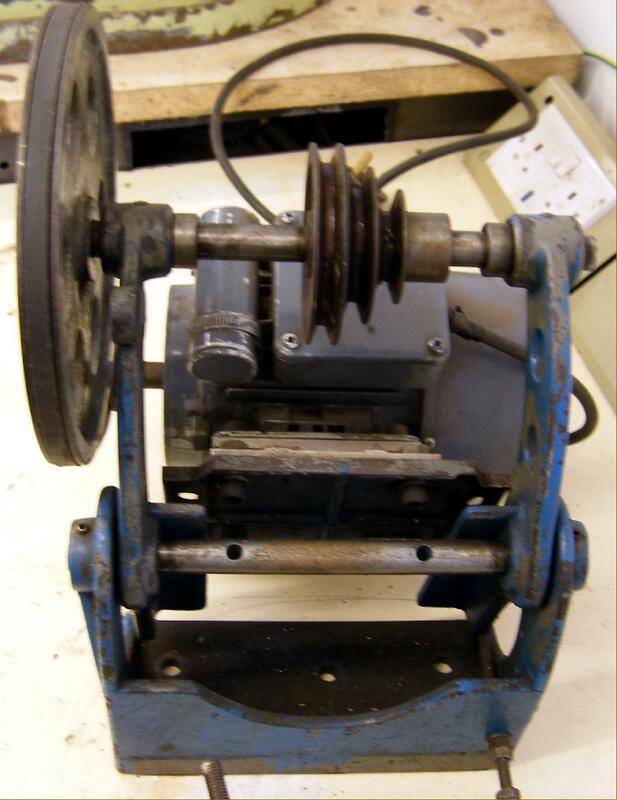 The tailstock was very much along the lines of that used on a Myford ML7, with a hollow No. 2 Morse taper barrel passing through the handwheel; unfortunately, instead of a proper pinch clamp, the barrel was locked by that horrid method, closing down a long slot in the casting. Tumble reverse was fitted as standard and included with each new machine was a set of ten changewheels (of identical specification to those used on Myford lathes) to drive the 5/8" x 8 t.p.i. leadscrew. 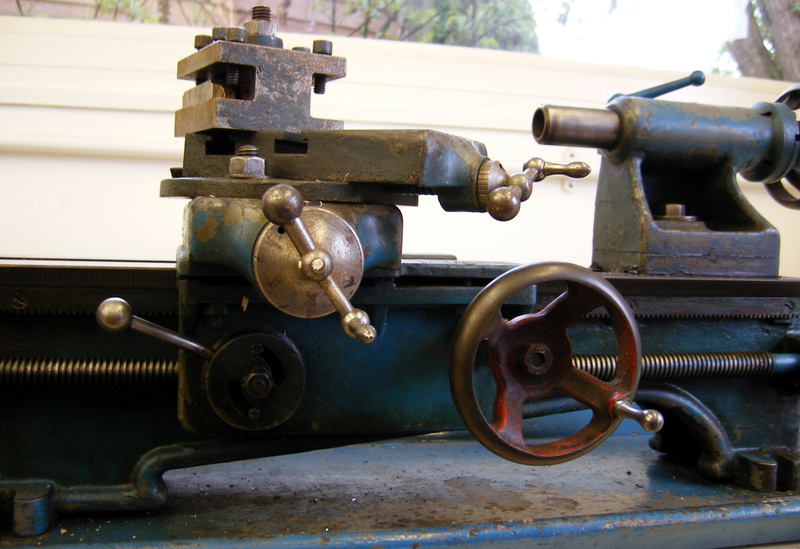 The lathe was marketed as both the "Warwick de-luxe" at £33 : 15s : 0d and the "Warwick Model Maker" at £28 - the latter an economy version that lacked covers over the backgears and changewheels, was bereft of compound slide-rest micrometer dials (though these could be fitted for an extra charge) and had no spare chuck backplate or screwcutting chart. However, when offered in a ready-to-run form, with countershaft and electric motor, (Model Maker 0.25 h.p., the De-lux 0.33 h.p.) prices rose to £39 and £45 respectively. Amazingly, even in the early 1950s, treadle versions were still available at £44 and £52 - possibly the last metal-turning lathes ever to be so offered. 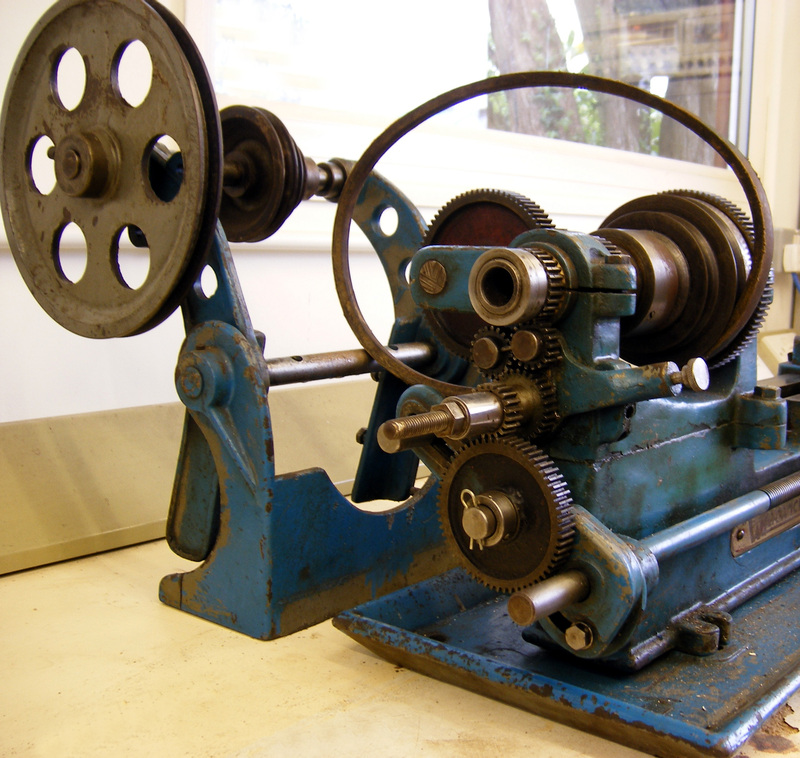 A rather confusing variety of models was offered, the designations changing from time to time to include, in the late 1940s, the DLA standard bench lathe at £33 : 15s : 0d; DLB bench lathe motorised at £45 : 0d : 0d; DLC bench lathe with universal or wall mounted countershaft at £38 : 10s : 0d; DLD stand lathe with tray and self-contained motor drive at £54 : 0s :0d and the DLE stand lathe with treadle drive at £50 : 0s : 0d. Later, model types changed to: M.M.A. 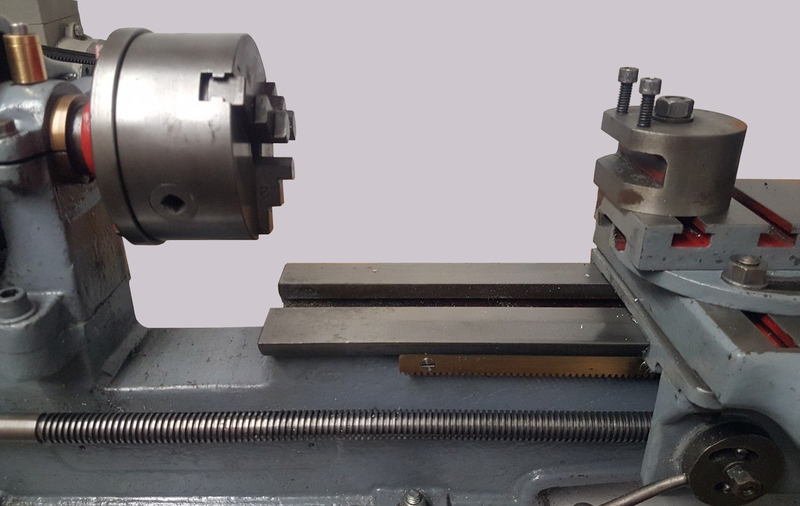 bench lathe for drive by a separate countershaft; MMB bench lathe with motor-drive (countershaft) attachment; M.M.D. stand-mounted complete with drive system and M.M.E. with stand and treadle drive. 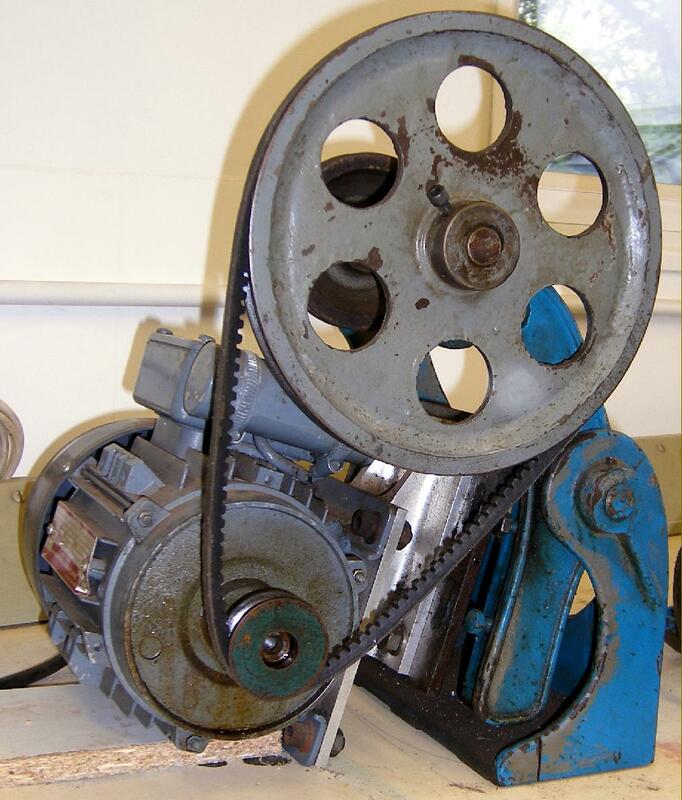 Most machines were delivered with a faceplate, driving plate, a spare chuck backplate, two centres, toolpost, screwcutting chart, screwcutting changewheels and guards. In the late 1940s and early 1950s a new Myford lathe was not always easy to obtain, with delivery times stretching as long as twelve months; the Warwick however, although an inferior machine, was a little cheaper and invariably advertised as being available "from stock" - and no doubt many potential Myford customers, frustrated at the long delays, plumped for bread today, instead of jam tomorrow. 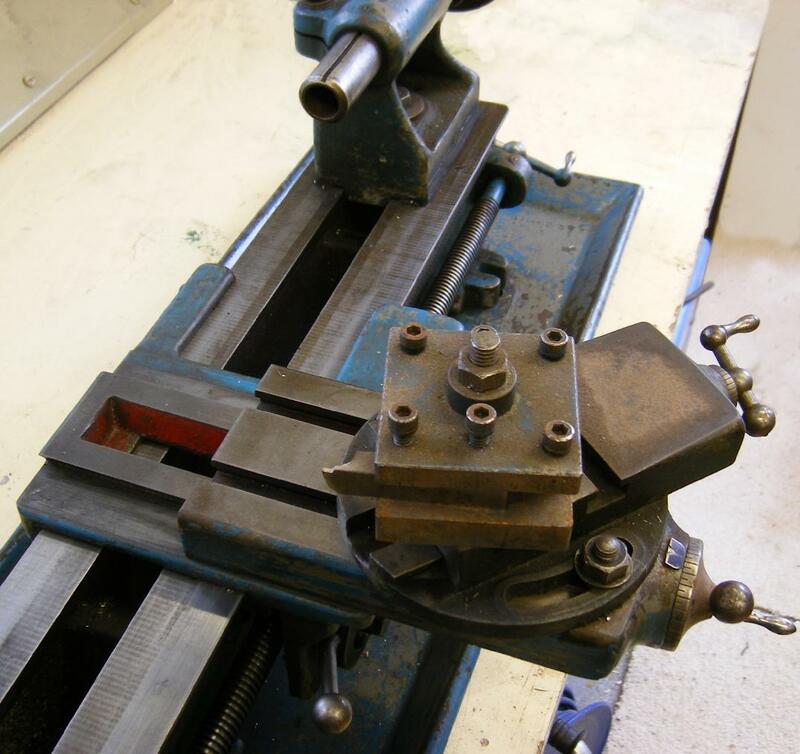 If you have a Warwick lathe the writer would be very interested to hear from you. 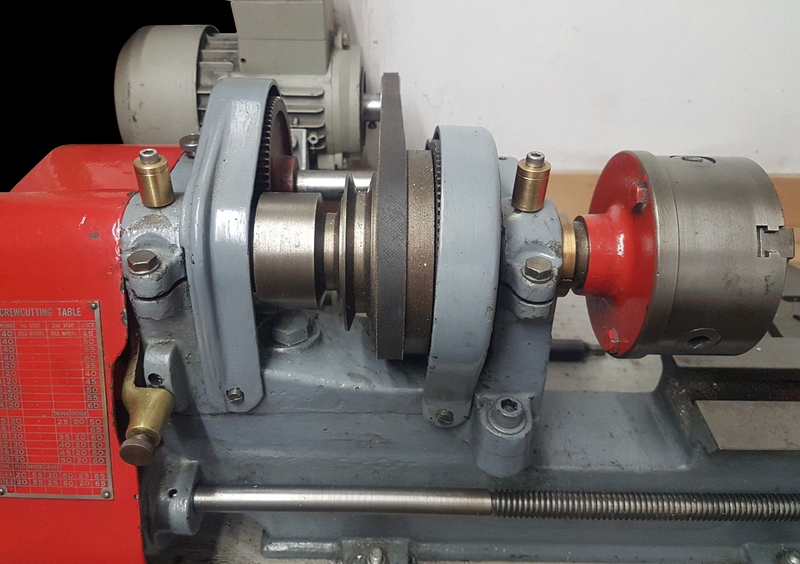 The customer could choose either a flat or V-belt drive to the three-speed, 0.5" bore spindle with its 1.125" x 12 t.p.i. 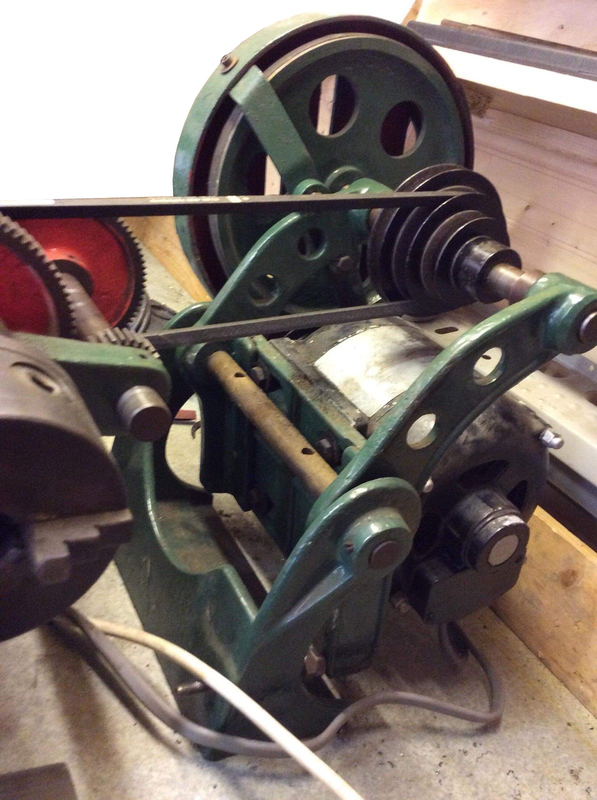 thread Whilst the nose thread was the same as that employed on the Myford Series 7 lathes (ML7 and Super 7) the register (between thread and abutment face) was a little larger.